Since the first Secret Life of Streamers of Streamers white paper in 2016, the premium online video market has changed dramatically. So too has the way we watch. In 2016, the PC ruled the roost for TV-style content. Now during prime time, it has fallen to third place in usage. However, it is not only device usage that has changed. The type of content we watch and from where we watch it has shifted too. The new white paper The Secret Life of Streamers Part II is sponsored by Conviva.~ It is available immediately for free download from the nScreenMedia website. The PC has seen declining use as a video device for some time. However, in 2016 it dominated the consumption of premium video. Conviva data shows that in Q1 2016, between 9 and 10 p.m. the PC averaged 5.4 million play requests and the connected TV 5.1. Just one year later, the number of play requests to the connected TV increased 75%, to 8.9 million, and PC requests decreased by a third to 3.7 million. The PC suffered declines in usage in all eight countries featured in the study. Between 2016 and 2017, the PC lost share of video plays in every country featured. Its share of video plays fell 27% in Spain and Germany, for example. However, it remains the most important device for premium video in China, Canada, Australia, and Norway. China stands out. The number of video plays to the PC declined sharply between Q1 2016 and 2017, from 72% to 58%. Though the Chinese are watching much more on their mobiles, they still watch the most on their PC. 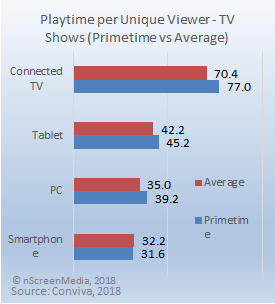 The connected TV, on the other hand, is only a major factor in four of the countries studied: UK, US, Spain, and Norway. Mobile video quality improved in all eight markets studied, with video start times plunging two-thirds in Australia and Canada. The white paper looks at many other aspects of our streaming lives, including in-home versus out-of-home usage, content type preferences, and at how quality varies around the world. To understand how much people’s relationship with online premium video has changed, you need to download The Secret Life of Streamers, Part II: Devices, Content, Location, Global Usage, and Quality. This free white paper from nScreenMedia has all new data and show you far online video has become a part of our everyday lives. ~Conviva worked with nScreenMedia to mine the data to reveal insights into consumers’ streaming video behavior. 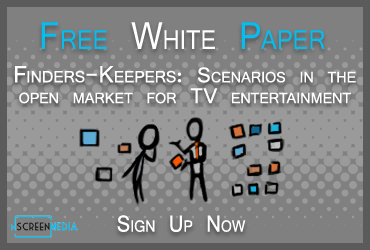 nScreenMedia independently analyzed the data and wrote the white paper.